3 years ago AhmadAwais Comment! 1. Can You Tell Us a Little About Yourself? How Are You Related to WordPress? Why did you Start WP-Pakistan? Sure, I am Ahmad Awais. I am nothing more but a regular full stack WordPress developer who loves to write, talk, build and share everything about WordPress. I have had been contributing to WordPress Core since WP 4.1, you can call me a front-end fanatic and an accidental designer. I love to create optimized but advanced workflows to produce crisp pieces of Open Source software. Well, I am a WordPress developer for last nine years. I wrote about it in my commitment to WordPress and this part of my life is called … WordPress at HeroPress. 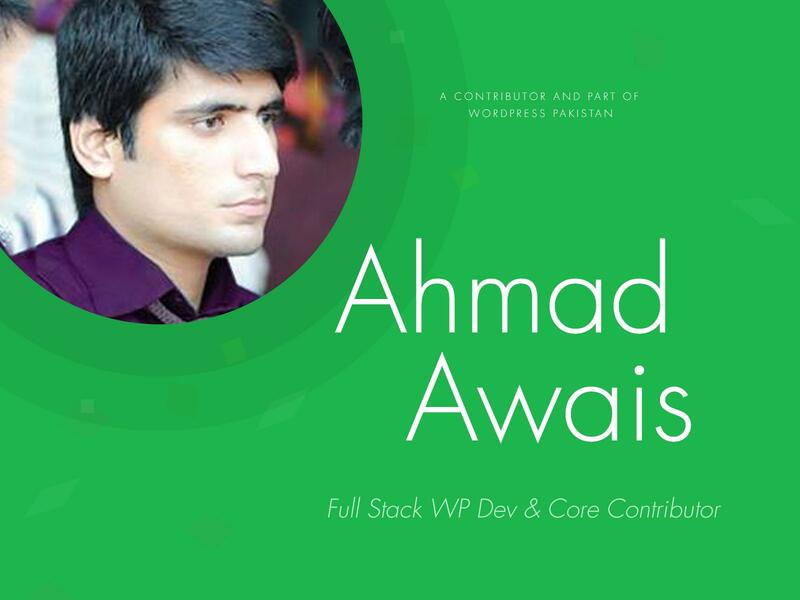 I started WP-Pakistan to help build a local WordPress community. WP-Pakistan.com is an initiative to curate a WordPress focused agile & active community of developers, designers & bloggers in Pakistan. In 2011, I started to get involved with WordPress community, at that time I start WP-Pakistan as a way for a group of us to conduct WP specific workshops. Later in 2014, after about 30+ workshops and free traning sessions, we conducted a WordPress Week, with 700+ participants it is the biggest local event about WordPress in Pakistan. Can You Tell Us About Your Open Source Contributions? One of the people I am most inspired by is Matt Mullenweg (co-founder of WordPress). I haven’t ever got a chance to meet him in person, but in 2014 when he wrote about Five for the Future, I committed to open source contributions in my new year’s resolution. To which, I contributed 10% – 20% of all the productive time I had in every single month of 2015. While my contributions are pretty negligible and insignificant, I did spend a good deal of time in these repositories, reading the source code and getting the hang of GitHub, throughout this year. I used a simple Perl script (here’s my gist) to fetch all this data and then hand picked a few of them. WordPress 4.2 Powell: My first ever core contribution for WordPress. I cannot explain the feeling. It was a long time coming, a dream of having to be able to do something like this, Oh My… I felt privileged to find my name in the WP core and that I somehow managed to affect 30+ Million websites. (What’s next? Shooting for stars.. the core commit access!). WordPress 4.4 Clifford: Six core contributions in this one and I wrote about it here. WP REST API: 12 commits so far, I am pretty excited about the REST API. I have experimented with it and am building a product which pretty much relies upon the REST API with ReactJS. TwentySixteen Theme: I contributed a few patches for cross browser compatibility of box-sizing in the next year’s default WP theme. WooCommerce: In 2015 alone, I have written more than 50 articles about WooCommerce. It was only fair that I contributed a little to this excellent piece of software. Easy Digital Download Same is the case with EDD, I wrote about it for more than 20 times and contributed a few source code docs improvements in agreement with WP standards. EDD Starter Theme Later in this post I will discuss a premium theme that I built called ProductPress. While developing this product, I was exploring EDD’s starter theme by Pippin and contributed a few source code improvements in it. Chasis: I started using Vagrants for local setup of WP. Chassis is a virtual server for WordPress, designed for simplicity and speed. I contributed to the installation instructions in this one. WP Calypso: I am super excited about Calypso that is why I wrote this pieceA Prediction, Calypso & What I Think Is the Next WordPress! And I contributed to the project. I plan to add more while I read its source code next year. Editus (formerly Lasso): Nick has built a pretty good editor. I used Editus for a month or so and contributed a security patch to update TGMPA’s security vulnerability. Titan Framework: I wrote more than 25 articles about this framework. My friend Benjamin did an amazing job building this lean and mean piece of software. My small contribution to this project just states the fact that I like this framework and am one of its backers. Timber: It is a plugin to write WordPress themes with Object-Oriented Code and the Twig Template Engine. I improved the source code docs standards in this plugin. I’ll be writing about it in January. Lean Theme: Being a theme developer, I find it kind of interesting to read how other theme devs code a bare bones theme. While I maintain one called Neat, I found Lean theme to be an interesting fork of Some-Like-it-neat. Contributed a capital_P_dangit()correction if you know what I mean ⓦ.